Or was it that Elvis, tired of his life, faked his death for anonymity? Or was it that Elvis wanted to go undercover as a Federal Agent?, or was it…….OK, so there are several theories why Elvis didn’t die on 16 August 1977. Anyway I digress. Joel Gilbert’s Elvis Found Alive is a sensational, evidence revealing ‘mockumentary’ supplemented by stunning new recordings by Elvis!! It is the follow up release to his fab 'mockumentary', Paul McCartney Really Is Dead: The Last Testament of George Harrison. The promotional material reveals that the sensational evidence presented in Elvis Found Alive arose out of Gilbert’s Freedom of Information Act request for US Government files on Elvis (which eventually led him to the home of "Jon Burrows"). The early scene of producer/director Gilbert and his staff receiving the ‘faulty’ FBI files is a scream! .......and you thought Elvis was only a singer!! The outcome is a rollicking ride with enough incredible claims and amusing one-liners to detract from a few periods when the narrative sags under the weight of its polemic. The incredulity of some of the claims or situations is part of the fun of watching Elvis Found Alive. During its 128 minutes running time we also learn new things about the King’s life. Did you he was an extra in Avatar or that Colonel Tom Parker was a pimp for the disc jockeys who first played Elvis’s records? A laugh out loud moment is “Elvis” describing Vernon copulating with his new wife and Elvis’ step-mother, Dee, as sounding “like they was killing hogs upstairs” (what a randy old devil Vernon must have been). 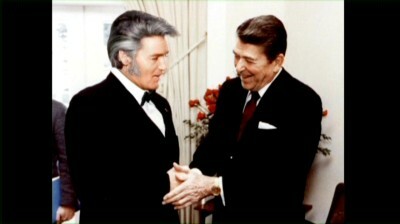 Elvis aka Jon Burrows with the former president of the Screen Actors Guild (SAG) in the US. Apparently he was also President of something else as well. I’m not going to give anymore away about the narrative except to say that Elvis Found Alive is well constructed and certainly has its moments (as long as you suspend rational thought and enjoy it for what it is – a parody delivered without a hint of being a parody). Gilbert’s Paul McCartney conspiracy ‘mockumentary’ has a slight advantage over Elvis Found Alive in gaining viewer engagement in that it is more ‘out there’ and its conspiracy tale more complex. Surely a testament to its production qualities, some buyers of Elvis Found Alive actually believed the producer/director was presenting a serious documentary! The CD Album: Some fans claim the voice on the album is Belfast postman James Brown, whose two albums using the moniker, The King, were excellent entries in the world of “I sound like Elvis” releases. The video is a sharp anamorphically enhanced, 1.78:1 widescreen transfer. In keeping with its nature, the archival footage exhibits more grain and undergone a few formatting changes to meet the 1.78:1 ratio. The Dolby Digital 2.0 stereo audio is similarly strong and clear with no discernible imperfections. But who is that singing?? Surely it’s not Elvis??? DVD Bonus Extras: The DVD includes several audio samples from the CD album which complements it. 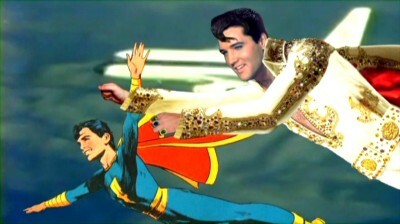 There is also a music video made by “Elvis” for Lisa Marie. Both the DVD and CD of Elvis Found Alive are released by Highway 61 Entertainment. Visit the "Elvis Found Alive" website and view the DVD trailer! !